How to revoke or cancel your Power of Attorney? Have you given a Power of attorney to someone you know? And later due to some reason you don’t want to continue the granting of power to the Attorney, or in situations where the Attorney is not ready to continue with the power granted by you, what should you do? A Power of Attorney deed is always registered and made legal through proper stamp duty and registration process. Hence as long as the deed remains in the hands of the Attorney he is legally entitled to enjoy the powers granted in the deed. And the principal cannot cancel it orally. Cancellation of Power of Attorney is also known as Revocation of Power of Attorney in the legal language. To revoke or cancel the Power of Attorney granted by the Principal and if registered, the same Principal (the person who granted the power) has to draft yet another Revocation Deed expressing his intention to cancel the earlier deed with effect from a particular date. Revocation Deed is to be drafted in a proper format on a stamp paper of due value and has to be presented to the Registrar or sub- Registrar office where the earlier deed was registered. 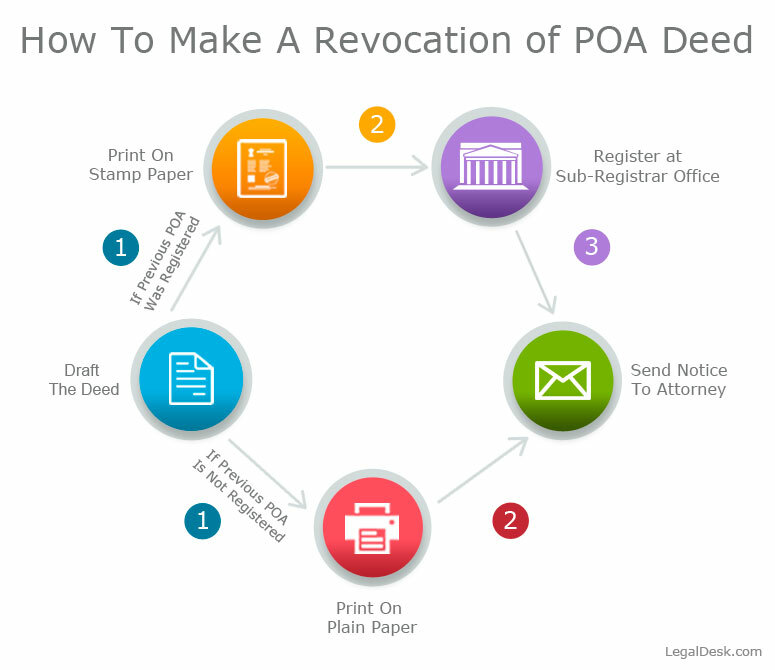 The Revocation Deed also has to be registered if the earlier Power of Attorney deed was registered. You also have to send a written notice to the person to whom the power was granted, that is the Attorney, mentioning the cancellation of the deed from the date of notice. Otherwise if the Attorney comes to know of your intention before the notice is given to him, he may opt to do some mischief in case he has any crooked ideas. If the Power of Attorney is not registered like the case of Special power of Attorney, where it is just made on a plain paper, and notarised, then a written notice to the Attorney mentioning the cancellation is enough. What should be included in the deed? The name of the Principal (the person who granted his powers to the Attorney) in the same spelling and format as in the earlier deed. The date of the Power of Attorney deed that is now being cancelled. The name of the Attorney in whose favour the power was granted in the earlier deed. The date of the revocation or cancellation. You can also elaborate on the nature of power that was given and the reason to revoke etc. though these are not mandatory. The registration of Power of Attorney is compulsory in some states and may not be so in other states. This is always under constant amendments according to the particular Government policies and keeps changing from state to state.Hence the general ways to make the Revocation of Power of Attorney legally valid also may be slightly varying according to the state where it is made. Drafting – First draft the deed on a Stamp paper of due value mentioning the details of the Principal, Attorney, date of previous deed, cancellation date and the details of the registration like date of registration, place, name of Sub-Registrar office and Deed number etc. Notice to Attorney – Remember to always send a written notice to the Attorney informing him of the cancellation. Registration – If the Power of Attorney deed was registered in a Sub-registrar office, then the Revocation Deed also has to be registered in the same registrar office to avoid any malpractices by the Attorney. Also a notice in writing has to be sent to the Attorney informing him of the Revocation. If the Power of Attorney deed was not registered earlier, then the Revocation Deed also need not be registered. It can be drafted in a plain paper and notarised and the copy can be sent to the Attorney. Is it compulsory to register the Revocation Deed? If the earlier deed of Power of Attorney was registered, then it is compulsory to register even the deed of Revocation in the same Sub-Registrar office, in order to avoid any future disputes. If the earlier deed was not registered, then there is no need to register the revocation Deed as well. What if the Attorney continues to use his power after receiving notice of Revocation? Once the Attorney is given the notice of cancellation of the deed which granted him powers to do certain acts on behalf f the Principal, he is no more entitled to use those powers. Inspite of that if he does any act on behalf of the Principal, then the Principal can take legal action on him. Also the Principal will not be bound by his such acts done after receiving notice of revocation. I have given a Power of Attorney to my cousin since I was hospitalised for a long period. It was not registered. Now I have regained my health and wish to cancel the power given. Since it is not registered, how can I cancel it? Is it enough if I call up my cousin and tell him orally? Since you have not registered your Power of Attorney, you can send a written notice on a plain paper or email to your cousin stating the cancellation of the power given to him with effect from the date of notice. And please do it fast, since if he has any wrong motives to commit some fraud, you may also become bound by it. Let him not know your intention until he receives the notice. Please don’t let it out before that. 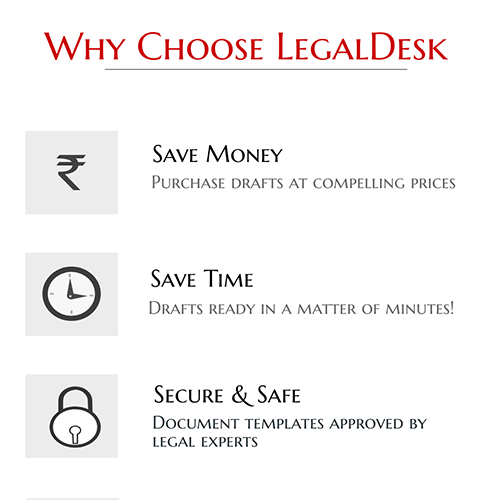 LegalDesk offers you an already drafted Revocation Deed and helps you to easily get a document within minutes. No hassles of finding a lawyer, or paying huge fees or finding appropriate words to include in the document. Everything is taken care of by us. You just need go to our website and fill the form, or just contact us if you need more help.